Plenty of storage and comfortable seating, all in one impeccably styled patio deck box. 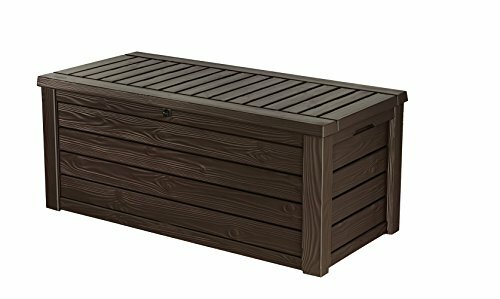 The Westwood Deck Box offers a generous 150 gallon storage capacity and provides bench seating for two adults, all while making an excellent accent piece for your outdoor d cor and patio furniture with its chic natural wood-paneled look. 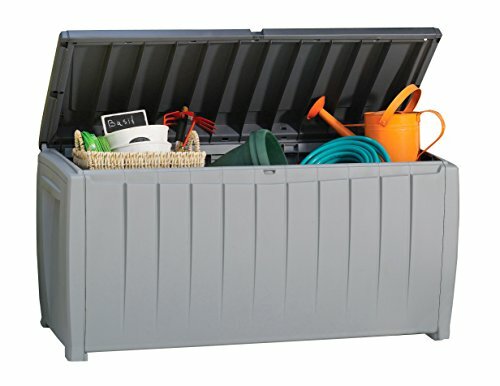 Made out of a durable resin, this outdoor storage box is fully weather-resistant, easy to maintain and keeps contents dry and ventilated. You will be thrilled with the versatility of this multi-purpose piece. It is ideal for pool storage, deck storage or garden storage, and when your guests arrive you will have no shortage of patio seating options. Large storage capacity perfect for storing large patio, pool and yard accessories. With its attractive natural wood-paneled look and seating capability, this deck box can be a part of your d cor as well as a convenient outdoor storage option. Thanks to its large capacity, it is suitable for all storage purposes and even fits some of your largest items like pool accessories and lounge chair cushions. Items are kept dry, ventilated and in excellent shape. With its weather resistance this deck box is low maintenance and easy to keep looking elegant. Automatic opening mechanism makes opening and closing easy, perfect for when your hands are full. Our Keter plastic Novel Storage Box is both versatile and attractive. Great for convenient storage outside, this bench box enables you to keep outdoor entertaining items close to where they will be used on the patio or deck. A colorful cushioned pad can be attached to the top of the lid to provide additional comfortable seating for two adults or three children during backyard get-togethers. The large capacity of nearly 90 gallons will hold up to eight cushions for multi-position chairs without having to fold or kink them. You can store a significant quantity of lawn and garden or pool equipment, tools, or supplies in the roomy interior of this handsome unit. Another great use would be hideaway stowage for outdoor or pool toys for the kids. Place it at the end of a path or against a garden wall to create a peaceful place to sit. Transform it into a beautiful and useful yard feature by adding large pots with gorgeous plants on each side. 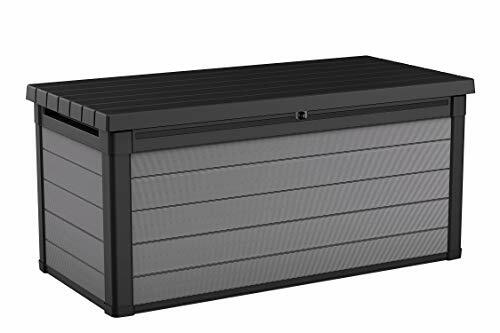 Whatever you decide to store in it, this handy plastic deck box will keep your belongings dry and mildew-free with ventilation openings and weatherproof construction. 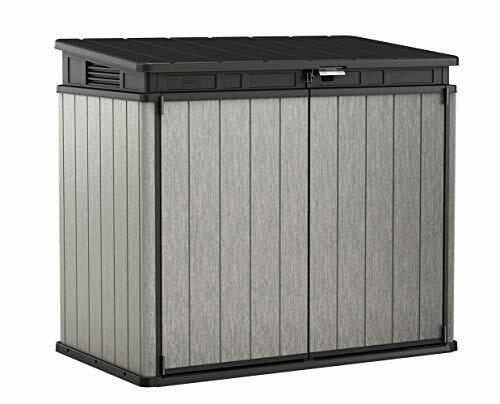 Available in a variety of color combinations that include black, gray, green, brown and beige, this unit will easily suit any outdoor decor. Featuring sturdy interior supports to prevent the lid from flipping open too far and a lockable lid that can be secured with a padlock that you provide, this deck box will provide safety and security beyond what would be expected from a typical plastic storage container. This product is made by Keter, a leading manufacturer of outdoor storage components, using durable polypropylene resin, a non-toxic and fully recyclable material that is easy to clean. It will withstand substantial amounts of sun, wind and rain, so you can feel free to use it in the yard or garden. Weight capacity: 485 lbs; Suitable for all storage purposes, keeping contents not just dry but ventilated. If you have a small yard, you won't want it cluttered with large outdoor storage boxes that take up most of your space. That s why you want the Circa Deck Box by Keter. You will enjoy 37-gallons of interior storage space - perfect for storing garden supplies, decorative outdoor pillows, pool floats, toys, pet supplies and more. Its ventilated sides ensure that everything you store stays safe and dry no matter the weather, while keeping your outdoor space clutter free. The Keter Circa Deck Box is truly a multi-functional piece. It s attractive enough to be used as a centerpiece on your balcony or patio. Enjoy it as a coffee table and set out a small meal or snack to share with family and friends. It's also a perfect place to enjoy a game of cards or a lovely complement as a side table to your favorite deck chair or chaise lounge. 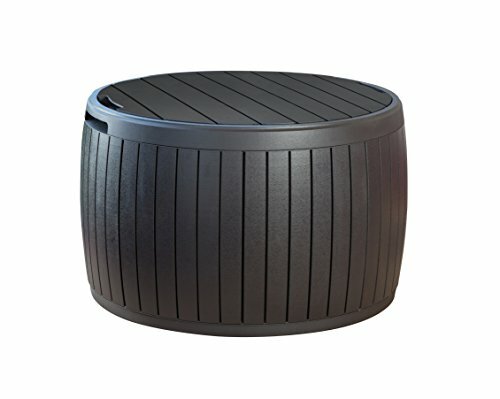 Its compact size and circular design make the Circa deck box ideal for use in any small outdoor space, and its roomy storage can fit pillows, blankets, toys or anything else you need to make you and your guests comfortable in your outdoor living space. Meet the original YETI the Tundra. This was our baby. Where it all started. Where we took our frustrations with cheap coolers and over-engineered the hell out of them. 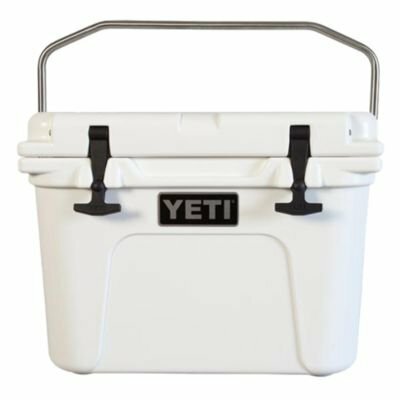 We ended up creating a whole new category of coolers with legendary toughness and famed ice retention. And now we make the rugged, all-purpose Tundra in enough sizes to fit any outdoor adventure. There's a good bit of its DNA in all the other gear we make too, in the form of patented and envied innovations. We're proud to see the Tundra has grown up to be the father of all coolers. Organize all your garden tools & outdoor accessories in a secure, Dry environment with the Keter Elite store horizontal storage shed. Constructed of weather-resistant resin, this shed features one-of-a-kind doutech panels, which have a textured, wooden look & can be painted to match your home or outdoor living space. 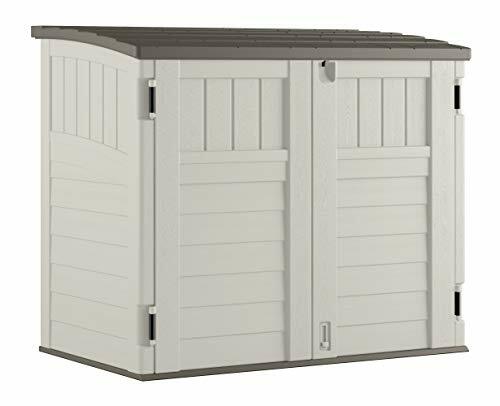 Strong & durable, This shed boasts reinforced double-wall panels & will not rush, dent or peel. It is easy to assemble with its tongue & groove panels. The double doors have chrome hinges & a lockable metal handle to ensure smooth operation & security. Storage capacity: 35. 5 cu. Ft.